Lock in a great price for The Harborfront Inn – rated 9.3 by recent guests! Immediately you are greeted with a warm welcome & bright smiles. The place is spotless yet cozy. The linens are plush & the beds are super comfy. The view is beautiful! 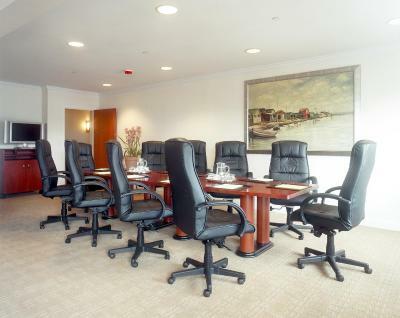 Wonderful location in Greenport center - exceptionally clean with friendly, professional & helpful staff. My partner and I loved everything about The Harborfront Inn. From the convenience, to modern comfort and cleanliness, we were blown away. Not to mention the amazing breakfast, fitness room and showers! Beautiful, spacious room..friendly and accommodating staff..awesome view.....in the heart of our favorite summer getaway town, Greenport! The location in town was perfect and the view of the harbor from our room was amazing. The breakfast was not great and the danish was beyond stale. Other then that we enjoyed our stay. The Harborfront Inn This rating is a reflection of how the property compares to the industry standard when it comes to price, facilities and services available. It's based on a self-evaluation by the property. Use this rating to help choose your stay! Offering a seasonal outdoor swimming pool and a fitness center, The Harborfront Inn is centrally located near the shops and restaurants in Greenport. Free WiFi access is available. A flat-screen cable TV and refrigerator are included in each guest room. The private bathrooms are equipped with a hairdryer and a bathrobe. A balcony is available for certain room types. A 24-hour front desk is available at the Greenport Harborfront Inn. Vending machines provide snacks and refreshments. 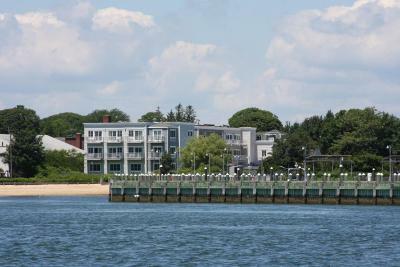 North Ferry Terminal is just 3 minutes’ walk from the property. Kontokosta Winery is 3 minutes’ drive. When would you like to stay at The Harborfront Inn? This king-bedded room features a flat-screen cable TV, refrigerator, air conditioning, iPod dock, bathrobe, Frette linens, C.O. Bigelow amenities and a balcony with partial water view. This room is on the parking lot side of the building. This king-bedded room is located on the first floor and features a water view, flat-screen cable TV, refrigerator, air conditioning, iPod dock, bathrobe, Frette linens and C.O. 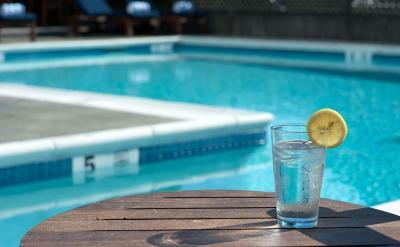 Bigelow amenities. Please note, this room may border the pool. This double room features a flat-screen cable TV, refrigerator, air conditioning, iPod dock, bathrobe, Frette linens, C.O. Bigelow amenities and a balcony with partial water view. This room is on the parking lot side of the building. This king-bedded room features a flat-screen cable TV, refrigerator, air conditioning, iPod dock, bathrobe, Frette linens and C.O. Bigelow amenities. Please note, this room is facing the village and may be handicap accessible. Located on the 3rd floor of the hotel, the Terrace Suite has bedroom with a king bed and a separate living room with a sofa bed. The bathroom includes a Jacuzzi® tub and a frameless glass shower. The suite also offers a private, 800 sqft deck with views of Peconic Bay, Shelter Island, Mitchell Park and Marina and Greenport Village. House Rules The Harborfront Inn takes special requests – add in the next step! The Harborfront Inn accepts these cards and reserves the right to temporarily hold an amount prior to arrival. Please note, extra beds cost USD 50 per night. Two additional guests may stay in each room for a fee of USD 50 per person per night. Children stay free. A recommendation from the property: All reservation deposits are nonrefundable. To avoid the costs associated with canceling, The Harborfront Inn strongly encourages guests to purchase trip cancelation insurance to cover pre-paid and nonrefundable expenses and deposits. Guests are responsible for any and all defaults due to illness, inclement weather, travel issues, or any other conditions that may prevent staying at the Harborfront Inn on all dates reserved. There is nothing I did not like about this property. What was there not to like!! The bed was our only complaint. Could just be us but it made our backs hurt because the mattress was so hard.